To add to the long list of websites developed by Blackout Design, we recently rolled out the carpet for the demo of Hydro4ge, a fourth generation development environment. Helping convey the power and stability of the Hydro4ge platform, we have been working to publicize this development for a long time running, and now it is finally here. 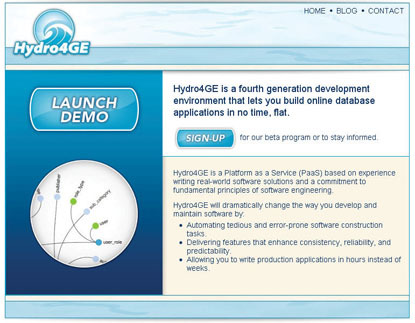 Hydro4ge is a Platform as a Service that offers an online database application that is easy to build and manage in very little time. To find out more information and take a closer look at the demo, visit www.hydro4ge.com.